Dr. Coleman’s technique, LipoStructure® or Structural Fat Grafting, (commonly known as fat injection, micro fat injection, lipo injection, fat transfer, lipo filling) can be used not only to rejuvenate and improve the contours of the face, but also to fill defects caused by injury or previous surgery. LipoStructure is used to correct previous surgeries such as deformities left from liposuction, hollow eyes after blepharoplasties, and flattened cheeks and jawlines left after a facelift. Fat can be used to rehabilitate traumatic injuries from automobile accidents, dog bites, elephant crush injuries, or other accidents. Fat grafts can be used to restore normalcy to birth defects such as hemi-facial atrophy, tuberous breasts, and Poland’s syndrome. In addition, fat can be used to augment the breasts, to correct deformities from breast implants, and to reconstruct breasts after cancer procedures. Recently fat grafting has become increasingly important in the treatment of problems which are a result of medical treatments such as radiation, chemotherapy, or steroid injection. Dr. Coleman began grafting fat to the face and body in 1987 and began grafting fat to the breasts in 1995. After decades of seeing the results that Dr. Coleman attains with fat grafting, many surgeons now perform fat grafting using a variety of techniques. What makes Lipostructure unique is the successful technique Dr. Coleman has developed through years of practice. The patient’s fat is removed via gentle, manual liposuction (removal by hand, no suction machine) from areas such as the abdomen, thighs, love handles, etc. – wherever the patient has some extra fat to donate. The suctioned fat is then specially processed by centrifuging to separate the oil and fluids to isolate the living fat. The centrifugation also concentrates the fatty tissue, associated stem cells and growth factors from the unwanted fluids and oil. The processed fat is then carefully placed into the areas to be treated using safe, blunt-tipped cannulas specially designed by Dr. Coleman for this purpose. Dr. Coleman’s unique technique involves placement of minute volumes of fat with each pass of the cannula, ensuring that the grafted tissue will have ample access to a blood supply – so necessary for survival of the graft. On the day of the procedure, the donor and graft sites will be marked on your skin with colored pens. Areas marked in green and blue indicate the areas where fat will be placed to change shapes; orange markers show the areas beyond which no fat will be placed; purple delineates areas of potential removal of fat; and planned incision sites are marked in red. This system allows you control over the procedure, as only the areas that you agree to be marked will be operated upon, and helps you to understand where we are removing fatty tissue and how we are placing it to improve contours. Marking: On the day of the procedure, the donor and graft sites will be marked on your skin with colored pens following the plan made with the blueprint at earlier consultation. Areas marked in green and blue indicate the areas where fat will be placed to change shapes; orange markers show the areas beyond which no fat will be placed; purple delineates areas of potential removal of fat; and planned incision sites are marked in red. This system allows you control over the procedure, as only the areas that you agree to be marked will be operated upon, and helps you to understand where we are removing fatty tissue and how we are placing it to improve contours. Harvesting & Refinement: The procedure for facial fat grafting involves first harvesting fat from the body. Since the volume of fat to be placed into the face is generally very small, we can usually remove fat from just one or two areas on the body that are bothersome to you. Obviously, this is an important part of the procedure, and we will want to design the removal so that your body shape is enhanced and problems are avoided. Facial procedures are usually performed under deep intravenous sedation with local anesthesia. Grading the fat for selective placement: After the fat is harvested, we refine and concentrate the fatty tissue using a centrifuge to remove the unwanted components (oil, water, blood, etc.). Our experience has taught us to grade the fat into different qualities, depending on density and other factors. We use the graded densities to obtain different effects. This is one of the keys to successful fat grafting. Sculpting while layering in the graded fat: We use the concentrated fat tissue to meticulously sculpt the face. The technique we have developed alters the shape of the face by placing miniscule amounts of fat at a time through three or four tiny entrance sites. The sculpting requires a three dimensional vision. Many surgeons place fat and then try to move it around or mold it, which can result in problems. Marking: On the day of the procedure, the donor and graft sites will be marked on your skin with colored pens. Areas marked in green and blue markers indicate the areas where fat will be placed to change shapes; orange markers show the areas where fat will not be placed, purple delineates areas of potential removal of fat; and planned incision sites are marked in red. This system allows you control over the procedure, as only the areas that you agree to be marked will be operated upon, and helps you to understand where we are removing fatty tissue and how we are placing it into your breast to improve your shape and increase your breast size. Harvesting & Refinement: The procedure for breast augmentation with fat involves first harvesting fat from the body. Some women have enough fat in one location (outer thighs or love handles), which makes removal much simpler. However, many women have had liposuction to their outer thighs and love handles, or simply do not have enough fat in one area. In those women, we consider numerous areas for harvesting (abdomen, flanks, inner thighs, knees, calves, arms, et cetera). Obviously, this is an important part of the procedure, and we will want to design the removal so that your body shape is enhanced and problems are avoided. The procedure is usually performed under sedation with Propofol as the main anesthetic agent. Formal general anesthesia (with a tube in the throat) is rarely needed. We use only board-certified anesthesiologists who have great familiarity with our procedures, facility and staff. Sculpting while layering in the graded fat: We use the concentrated fat tissue to meticulously sculpt the breast. The technique we developed alters the shape and size of the breast by placing miniscule amounts at a time through three or four tiny entrance sites located in the breast crease and the areola. 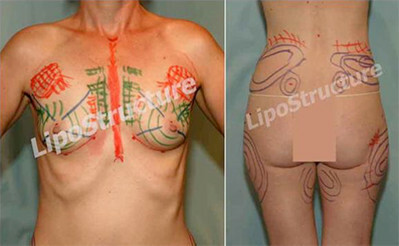 The sculpting requires a three dimensional vision while the fat is being placed into the breast. Many surgeons place fat then try to move it around or mold it, which is can result in many problems. Special Considerations: If we believe using the BRAVA system will enhance your outcome, we will discuss this during the second part of your consultation. If indicated, we usually like patients to wear the device for at least 6-8 hours/day (usually during the night) for at least three weeks prior to the procedure. We will often have patients use the device after surgery for a few weeks in order to maximize blood supply and viability of the newly grafted fat. There is evidence that the BRAVA may increase the volume of viable fat if worn during the first month or so after the fat transfer to the breast. Marking: On the day of the procedure, the donor and graft sites will be marked on your skin with colored pens. Areas marked in green and blue markers indicate the areas where fat will be placed to change shapes; orange markers show the areas where fat will not be placed, purple delineates areas of potential removal of fat; and planned incision sites are marked in red. This system allows you control over the procedure, as only the areas that you agree to be marked will be operated upon, and helps you to understand where we are removing fatty tissue and how we are placing it back into your body to improve your shape. Harvesting & Refinement: The procedure for correction of liposuction deformities and buttock augmentation with fat involves first harvesting fat from the body. Some patients have enough fat in one location (outer thighs or love handles), which makes removal much simpler. However, many patients have had liposuction to their outer thighs and love handles, or simply do not have enough fat in one area. In those patients, we consider numerous areas for harvesting (abdomen, flanks, inner thighs, knees, calves, arms, et cetera). Obviously, this is an important part of the procedure, and we will want to design the removal so that your body shape is enhanced and problems are avoided. Because of the amount of fat tissue that needs to be removed, we usually perform the procedure under general anesthesia. However, for much smaller procedures, we use local anesthesia with sedation. Sculpting while layering in the graded fat: We use the concentrated fat tissue to meticulously sculpt the body. The technique we developed alters the shape of the body by placing miniscule amounts at a time through three or four tiny entrance sites. The sculpting requires a three dimensional vision while the fat is being placed into the body. Many surgeons place fat then try to move it around or mold it, which is can result in many problems.